Rain Backup in a Box® [SD] for shallow dig tanks - the plug-and-play mains water backup for rainwater harvesting systems. When the rainwater runs out this simple controller will top up your tank to a minimum level with mains water - safely and economically. Another eco-innovation manufactured by Rainwater Harvesting Limited. Rain Backup in a Box® [SD] for shallow dig tanks - the plug-and-play mains water backup for rainwater harvesting systems. Rainwater harvesting plays a large role in reducing the dependence of any building on expensive treated water from the mains. Toilet flushing, clothes washing and any outdoor use of water can be assured by rainwater. In most cases the total mains use of the building can be cut in half. But what about in time of drought? Every system needs a mains water backup to keep the appliances going. The simplest way is a float switch and solenoid valve; the float switch detects when the rainwater storage tank is empty and opens the electrically-activated solenoid valve so that mains water flows into the bottom of the tank. When the float switch floats off the bottom of the tank it turns the solenoid valve off. The bulk of the storage tank remains empty ready to admit the water from the next rain shower. U.K. Building Regulations require that rainwater cannot possibly flow back into the mains water supply. For this reason all mains backup devices must have an air gap where the mains water flows into the rainwater tank. The simplest way to do this is for the mains water to flow through open air into a funnel shaped device called a tundish. It can be seen in the photo at the bottom right of the unit. The Rain Backup in a Box® is fitted inside the building where the occupiers can see and hear it. 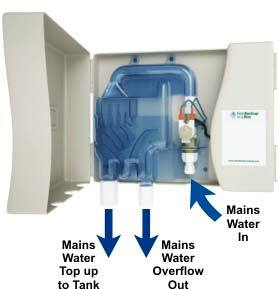 When rainwater has run out, any mains water running from the solenoid valve into the tundish can be seen through the transparent cover and can be heard through the aperture at the side.The Rain Backup in a Box® replaces a higgle piggle of components with a single wall mounted unit, one electric plug to a wall socket, mains water input and a pipe to the underground storage tank.